Check out Mark Bittman’s article today from the New York Times about the true value of local, producers-only farmers markets. Brown rice has always been my culinary Kryptonite. No matter how many times I’ve tried to make it, I could never seem to get it right. One particularly mushy tray of brown rice may have even cost me a catering job one time. Unlike white rice — which is so simple to make it practically jumps into the rice steamer and cooks itself — brown rice is really difficult for me to get right. It either turns out too crunchy, too mushy, or sometimes both in the same pot. The problem has to do with the cooking time. While white rice is fully cooked in about 15 to 20 minutes, brown rice typically takes between 45 minutes and an hour to fully absorb all of the liquid. And a lot can go wrong during that amount of time. Yet I truly want to be able to cook brown rice perfectly time after time because it has a lot more nutritional value than white rice. That’s because it still has the bran and the germ, which are removed with white rice. These make brown rice both higher in protein and give it a chewier, nuttier flavor than more “processed” rices. 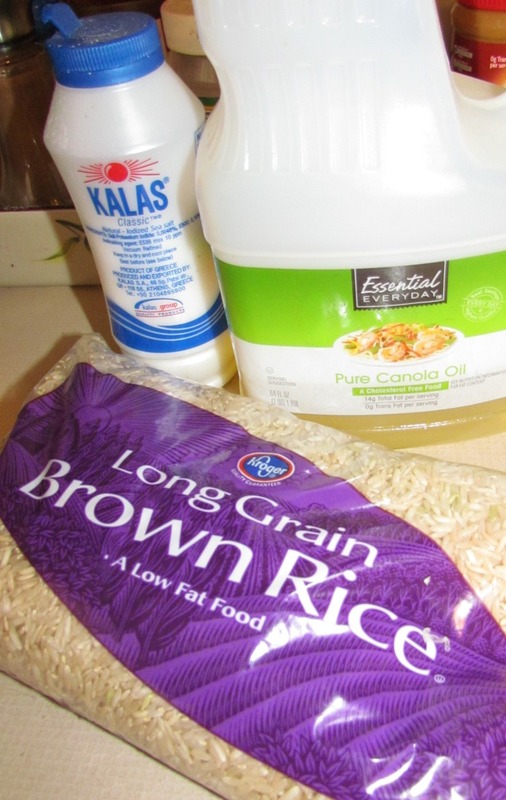 Over the years, I’ve tried every preparation method for brown rice that I could get my hands on. I’ve soaked it, rinsed it, and even fried it in oil before cooking it. But it always turned out like a failed science project. I’ve probably thrown away more ruined batches of brown rice during my cooking career than any other type of food. But the other day, I finally learned the secret to defeating brown rice. I was listening to Terry Gross on National Public Radio while walking our three dogs. She had two cookbook authors on her program from America’s Test Kitchen. They have a new book about gluten-free cooking out and when the subject of brown rice came up, I was all ears. They said that the trick to cooking brown rice wasn’t just the time, but the temperature. 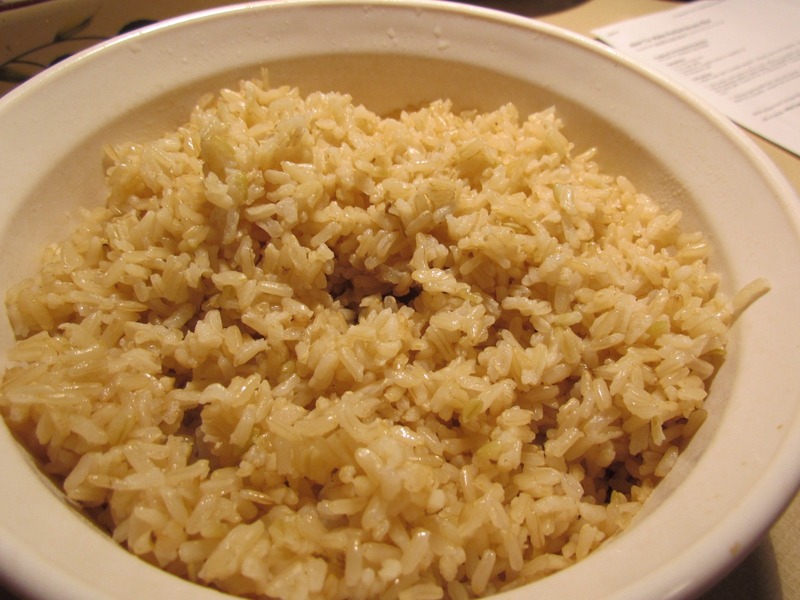 Given its structure, brown rice needs to hold a constant high temperature in order to absorb all the liquid evenly. So when you simmer it, the rice on the bottom of the pot is cooked faster than the rice at the top of the pot. And when you let it sit covered for a few minutes after cooking it, the rice in the center keeps absorbing liquid, often resulting in the starchy, unappetizing mess with which I am so familiar. I’ve been battling my arch-nemesis, brown rice for years,so I practically ran home to try it out. And it worked! About an hour later, I had three very tired dogs and one delicious pot of fluffy, perfect brown rice. Thank you people from America’s Test Kitchen. You’ve allowed me to reach a peace accord with what was once my worst enemy, brown rice. 1. Preheat oven to 375F. Pour dry rice into a baking dish. 2. Combine the water and oil in a pot and bring to a boil. Stir in salt then pour liquid over the rice. Cover the baking dish tightly with two sheets of aluminum foil and place on the center rack of the oven. 3. Cook for 1 hour, then remove from oven and uncover. Fluff the rice with a fork then cover the dish with a clean dish towel and let the some of the excess steam escape for 5 minutes while some of the steam is still absorbed by the rice. Serve immediately and cheer your victory in your life-long battle against brown rice. Mozzarella is officially my favorite cheese. That’s because it’s what goes on top of my favorite food: Pizza. Because I love pizza so much, I am very particular about the mozzarella I use. I prefer a very specific type of low-moisture, part-skim mozzarella that comes from a particular local supermarket because it has just the right hardness for grating, melts perfectly, pulls from the pie exactly the right way, and has the precise fresh taste that I enjoy most. Over the years I’ve used all kinds of different types of mozzarella cheeses, both at home and in restaurants. For pizza, the best kind is low-moisture, part-skim that hasn’t been grated. It usually comes in a 16 oz. ball or log shape in a vacuum-sealed package. The absolute worst kind you can use — and, ironically, the most common — is the pre-shredded mozzarella. This is the ubiquitous cheese you find hanging in plastic envelopes in any grocery store dairy case. Unlike most other cheeses, mozzarella has a very high moisture content. So it doesn’t stay fresh for very long, especially after you grate it. Have you ever noticed that it will start to harden and curl up if you leave shredded mozzarella in the refrigerator overnight? 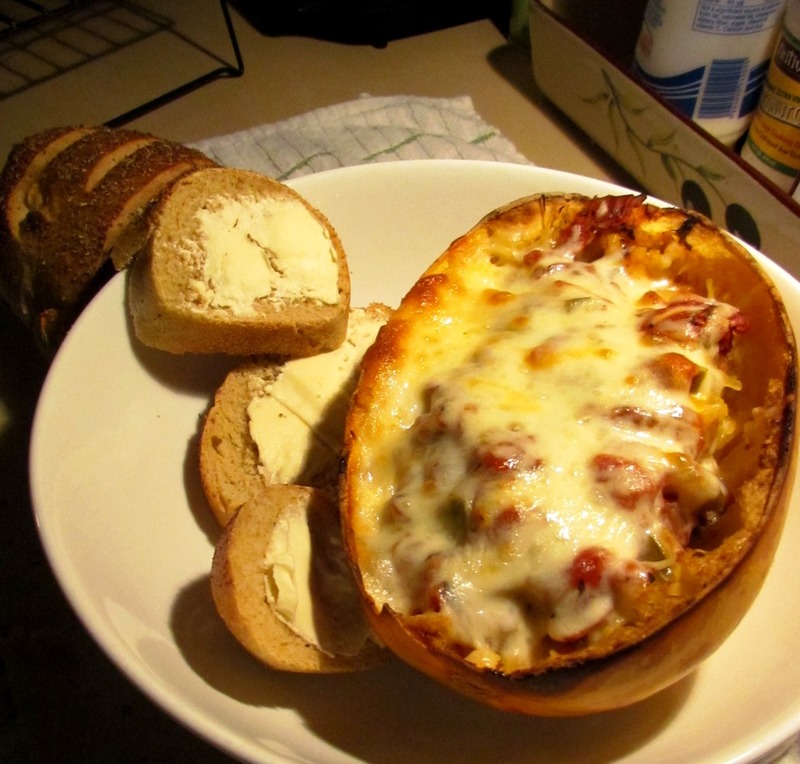 Or that the cheese on frozen pizzas bears no resemblance to the freshly grated mozzarella used on a made-to-order pie? Manufacturers of pre-shredded cheeses treat them with powders including corn starch, potato starch, and powdered cellulose, which is made from wood pulp that has been chemically treated to extract its fiber. These prevent the cheese from caking and also extend its shelf life. The result is a dull, dry, relatively tasteless cheese. Believe it or not, many pizzerias, especially the big chains, use “bagged cheese” — the commercial equivalent of the grocery store variety — because of its convenience. But you can definitely taste the difference between a pizza made with freshly grated mozzarella and the-shredded kind. Low-moisture, part-skim mozzarella is made from skim milk. If it hasn’t been grated will last at least a week in the refrigerator in its vacuum-sealed package. 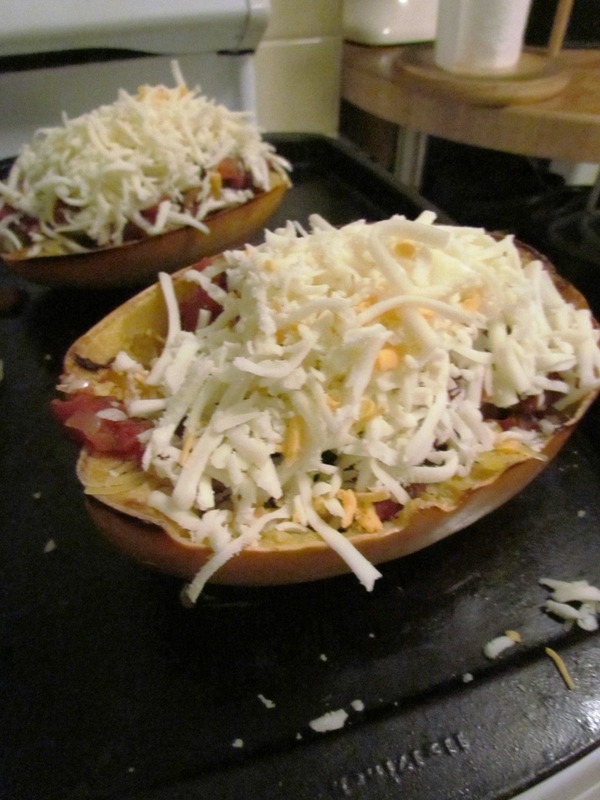 Once you open it, the cheese will lose its flavor quickly, so it’s a good idea to grate it and use it all right away. Mozzarella that is made from the whole milk is softer and has a different flavor that low-moisture, part-skim variety. It’s the mozzarella you use for Insalata Caprese or to eat fresh, uncooked by itself. You can put it on pizza, but it has a wetter texture when it melts and lacks most of the appealing stringiness that makes pizza so delicious. When you buy mozzarella made from whole milk, it usually comes in balls or ovals about the size of a tennis ball and soaking in brine. You also can get “ovallini”, which is the same cheese except formed into smaller balls about the size of large marbles. In either case, ask that the deli attendant to add a little of the brine — after they weigh the cheese, of course — so that it will stay fresh longer in your refrigerator. Try to use it within a day or two for optimal flavor. I’ve used buffalo mozzarella in high-end restaurant kitchens. Contrary to what most people think, it’s not made from the milk of the American buffalo — which has been pretty much killed off — but from milk taken from the domestic Italian buffalo, which is more like a water buffalo or ox. It’s flavor tends to be more defined and a little grassier, but it’s cost prohibitive for home use, at least for me. Smoked mozzarella has a rich, smoky flavor. The smoking process evaporates more of the liquid so it has a harder texture, almost like a brie. It’s very nice as a spread or in a salad, but is not ideal for pizza. Freshly grated mozzarella, either the low-moisture, part skim variety or the fresh kind — is ideal for topping pastas and is a key ingredient in any type of parmesan dish such as veal parmesan, chicken parmesan, eggplant parm, etc. Really nice, durable high quality mozzarella can be found in most major supermarkets or grocery stores. Stay away from the pre-shredded variety and you should be in good shape. It’s been a very cold winter so far in Chicago this year. Today’s high temperature is only 2 F and earlier this month we tied the all-time Chicago low record temperature of -16 F. That’s really cold for around here, although it sounds like it’s bad everywhere this winter (even Australia, where they are having a deadly heat wave!). It hasn’t been so bad for me because I work (mostly) out of the house. So far, it’s only cost me one car battery. But I really feel bad for our dogs, especially Max. Normally, Bud, Max and I walk at least a mile each day. We all look forward to it and It burns a surprising amount of energy in them. When it gets colder than 20 F or so, it’s simply too cold for the dogs, especially for Max, who has a thinner coat and is shivering by the time we make it to the corner. 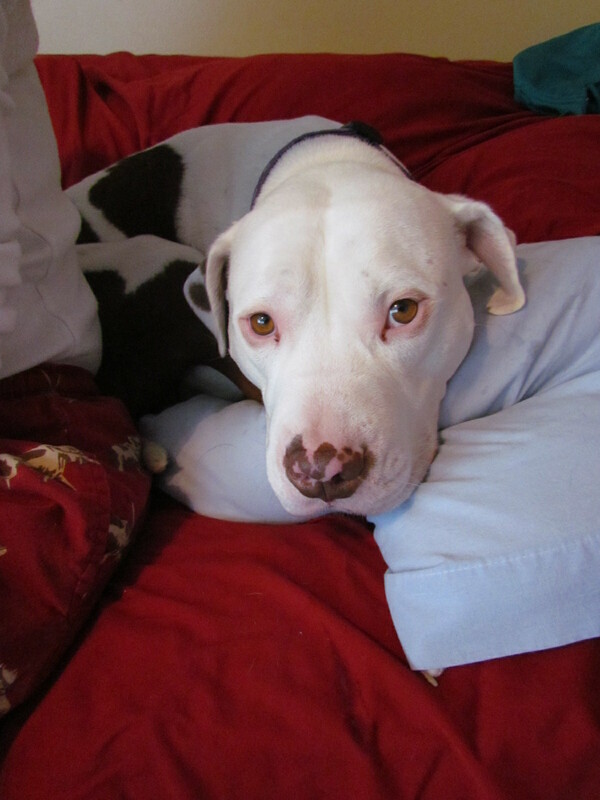 And when they don’t get to walk and are stuck in the house all day, they get really charged up. Bud has been particularly naughty lately. One benefit of this cold weather is that it makes hot soup such an appealing option for dinner. 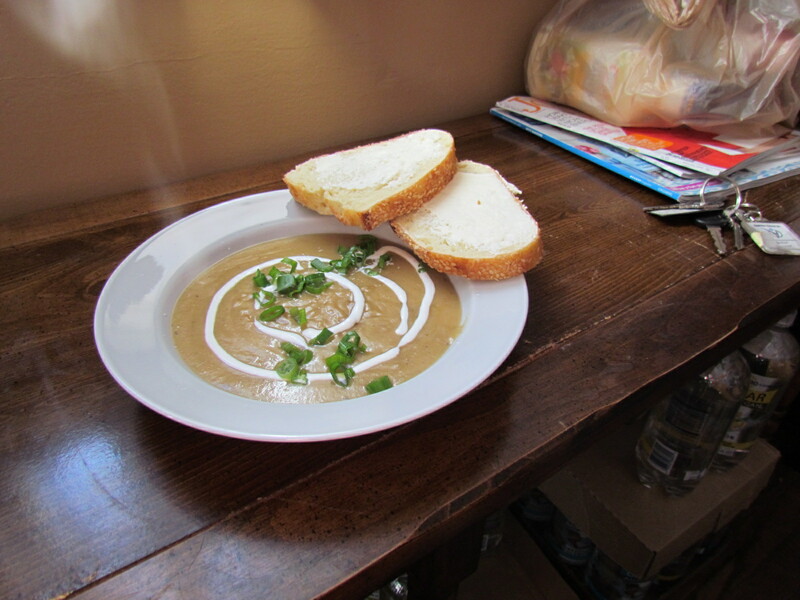 This winter, Sandi and I have been featuring soup/salad/homemade bread one night per week since before Thanksgiving. I’ve really enjoyed making traditional favorites such as split pea and mushroom barley (we’ve been eating vegetarian since last April, so this is our replacement for the old standby beef barley), and experimenting with new soups, such as this wonderful Apple and Parsnip Soup that I found on the truly amazing VegHotPot blog. What I love about this soup is it’s unusually complex flavor. It’s similar to a vichyssoise but with an apple and a couple of parsnips added. Yet because parsnips have such an interesting flavor — both sweet and slightly tangy, even smoky — that this soup really makes you sit up and take notice. Parsnips are one of the most interesting — and often overlooked — of the winter root vegetables. They actually were used as a sweetener in Europe before sugar cane and sugar beets were introduced there. And they were the primary starchy vegetable in the US until they were overshadowed by potatoes after the Irish emigration in the 19th Century. Roasted parsnips continue to be a traditional holiday dish in many families. This recipe is vegan, although I added a swirl of sour cream for the photo. Stay warm, everybody. Spring is coming, I promise! 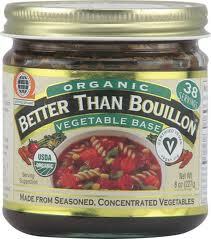 I’ve been using this organic vegetable base. 1. It’s important to prepare the all the fruit and vegetables before you start cooking because the high sugar content in the onion, parsnip, garlic and apple can cause them to cook quickly and the caramelization can cause the soup to darken. 2. Put a soup pot over a medium flame. When hot, add a drizzle of olive oil and let it heat up for minute then add the onion, leek, garlic, cumin and thyme. Saute for around 4 to 5 minutes on a low/medium heat until they soften then season with salt and pepper. Add the parsnip and potato and cook for another couple of minutes, stirring frequently so they don’t brown. 3. Add the apple, water and vegetable base, bring to a low boil then reduce to a simmer and cook over a low heat for about 15 to 20 minutes. Remove from heat. Puree the soup using either an immersion blender or by blending batches in a blender until the soup is smooth. Like most soups, this one will taste even better the second day, once the flavors have had a chance to get to spend some time together in the refrigerator. You can garnish this soup with a crusty spicy crouton, a sprinkle of sliced chives or scallion, or a swirl of sour cream or creme fraiche from a squeeze bottle. Lately, I’ve been getting into making homemade bagels. I remember vaguely making them in culinary school, and of course I love getting fresh bagels and cream cheese at Dunkin’ Donuts or Great American Bagel, but it was only recently that I rediscovered how easy and fun they are to make at home. Basically, my bagel dough formula is exactly the same as my pizza dough formula. The only difference is that I substitute a little of the flour with corn meal. This changes the flavor slightly — it’s just a little bit sweeter — and also affects the texture, giving it a little more chewiness. What makes bagels different than dinner rolls, burger buns or bread, for that matter, is that their outside skin has a little “bite” to it. 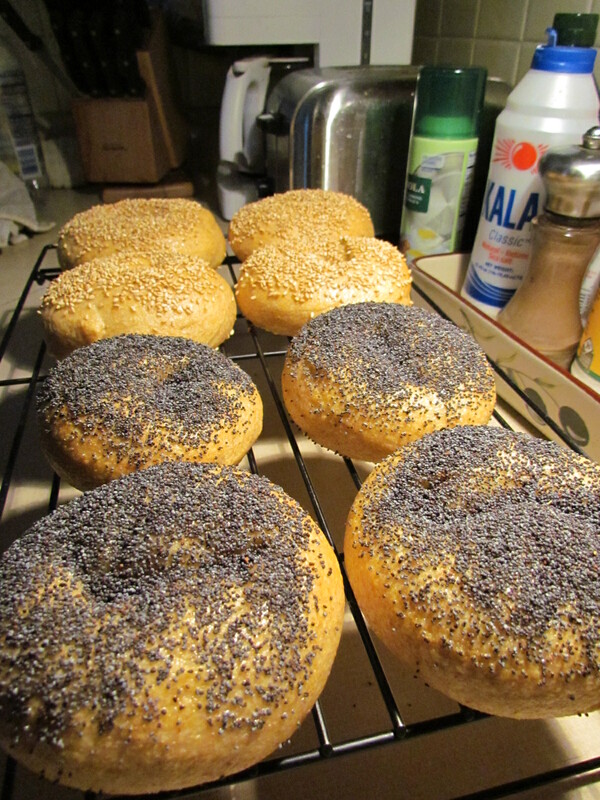 This is accomplished by boiling the dough after it has been formed into the traditional bagel shape and allowed to rise overnight in the refrigerator. Making bagels the right way is a two-step process. In fact, it’s a two-day process because you make the dough the night before and proof it in the ‘fridge. I suppose I could just let it rise on the counter the way I do with pizza dough, but putting it in the refrigerator overnight helps to develop the “snap” of the outer skin. My wife, Sandi, always says this makes it a complicated process, but it’s not really. Each step only takes a couple of minutes and the payoff — fresh, homemade bagels in any flavor you want — makes it totally worthwhile. My favorite part of making bagels is adding whatever toppings I want at the end. I bought a big container of poppy seeds at my excellent local produce market, but I also like to use toasted sesame seeds, dehydrated onion, and garlic powder. I made cinnamon raisin bagels by simply adding a little sugar, cinnamon and raisins to the dough. If you try this, be warned: A lot of the raisins pop out when you knead the dough and you have to keep pushing them back in. For my next batch, I bought some dehydrated blueberries for blueberry bagels. Using dried blueberries rather than fresh or frozen blueberries helps prevent the dough from turning purple. I’ll give you an update later as to how they turn out. 1. Whisk yeast and sugar into warm water in a mixing bowl (I use the bowl of my Kitchen Aid) and set aside for a minute or two to let the yeast activate (little bubbles indicate the yeast has awoken from its slumber!). 2. Meanwhile, combine the flours, corn meal and salt in another mixing bowl and stir together. 4. Remove the dough from the mixing bowl and knead with your hands for a few minutes until the dough is smooth and springs back when you poke it. If it’s too wet (sticks to your hands while kneading it) simply add a little more A/P flour until it’s the proper consistency. Place the dough in a clean, greased mixing bowl, flip it over so ther is oil on all sides, cover with a clean dish towel and let it rest in a warm, draft-free place until it doubles in size, about an hour or two. 5. Punch the dough down, let it rest for about five minutes, then cut it into eight even pieces (I cut the dough in half, then cut those peices in half, then cut them each in half again). Meanwhile, spray a sheet pay with pan spray and dust it lightly with cornmeal. Take each individual piece of dough and use your hands to roll it into a log, about eight inches long. Then twist the cylinder of dough around your hand — with the seam on the inside part of your hand — and squeeze to bind it together into a ring. You may need to pinch the seam a little so there is a smooth seal, otherwise it might open up during the proofing/boiling/baking stage. As you make each bagel, place it on the sheet pan with the best side facing up. When all the bagels are formed, cover the sheet pan lightly with plastic wrap and place it in the refrigerator overnight. Or you can make the bagels in the morning and let them proof all day, at least eight hours. 6. When you get up the next morning, the first thing to do is to put a large pot of water on to boil and preheat your oven to 450F. Remove the bagels from the refrigerator, carefully peel off the plastic wrap and let them warm up a little while you wait for the water to boil. Once it’s at a rolling boil, use a spatula to place the bagels into the water a couple at a time — thanks to the trapped air from the proofing, they will float. Boil one minute on one side then flip them over with the spatula and boil them another minute on the other side. Carefully use your spatula to remove each bagel from the boiling water, letting the excess water drain for a few moments, and place them back on the sheet pan, rounded side up. 7. Brush each bagel with egg wash and sprinkle with whatever topping you want. Then place them right away into the oven and bake for 20 to 25 minutes, until they are browned and sound hollow when you tap them. Transfer to a cooling rack and let them cool to room temperature. These homemade bagels are amazing when you eat them fresh. They are also really fun to give away. Enjoy! One of the benefits of living in the Midwest is that in the summer time, corn is extremely inexpensive. When the sweet corn crop is in full swing — around July through September — it can get as low as $.10/ear or even less. That makes it one of the affordable vegetables you can buy. The best thing about sweet corn is that it is so versatile. You can eat it off the cob or cut it off and eat it as a side dish. Or it can be incorporated into just about anything. In fact, today corn is probably the most important crop in the US, even more so than wheat. That’s because there are a lot of uses for it besides eating it, such as the alternate fuel ethanol, feed for livestock, distillation into whiskey and other liquors, the sweetener high fructose corn syrup, industrial applications, and many others. Where I live, in northeast Illinois, corn is the biggest and most important crop. As soon as you get out of the city and suburbs of Chicago, you find hundreds of miles of corn fields in every direction. Farmers around here alternate their fields with corn one year then with soybean the next in order to provide the most nutrients in the soil to ensure maximum yield of both crops. Generally, Illinois corn isn’t used for eating. Most of it is sent to factory farms where it is used to feed livestock. 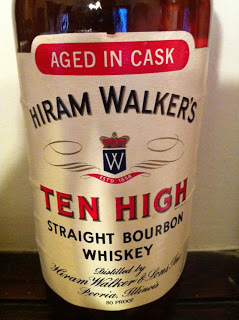 The rest is sent either downriver to Peoria where for generations it was turned into corn mash and other liquors at the Hiram Walker distillery. Archer Daniels Midland now uses corn to make vodka, gin and other liquors at the plant. Or the Illinois corn travels upriver to Summit, outside Chicago, where it is used to make corn starch at the big Argo plant, which is about three miles from my home. I can often smell aroma of cornstarch being made when the wind is blowing from the west. Personally, I love the taste of charred sweet corn. As its name implies, sweet corn is full of natural sugars.So when you let it get a nice dark char, the sugars will caramelize, giving it a unique and delicious flavor. Usually, I will cut the charred corn off the cob so that I can add it to salads, sauté it with zucchini or other vegetables, or toss it by itself with a little olive oil, sea salt and fresh cracked black pepper. All you do is remove the corn from the husk and pull off any silk, then boil it for about nine minutes. I will often do this ahead of time — such as in the morning — then store the fully-cooked cob corn in the refrigerator until I’m ready to grill it. Spray it with a little pan spray, season it with salt and pepper, then throw it onto a pre-heated grill. You don’t have to pay a lot of attention to it. Just turn it once or twice so that it gets a relatively even char. 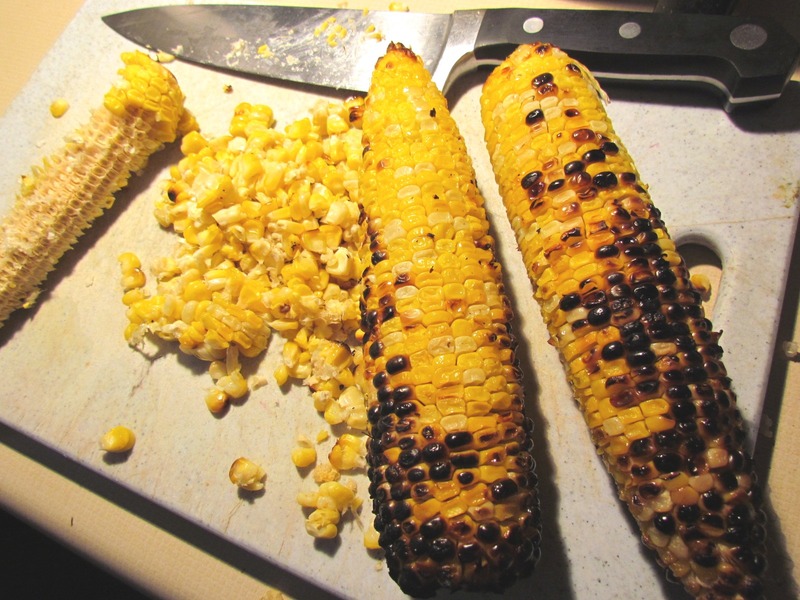 Remove it from the grill, let it cool completely, then use a knife to cut it off the cob. Charred corn can be stored in the refrigerator for a few days or frozen for at least a month until you are ready to use it. It’s very handy to have around and will add a sweet distinctive flavor to just about anything. Thanks to efficient transportation, fresh corn still in the husk from Florida, California and Mexico is available pretty much year round. But it is at its sweetest, freshest and cheapest during the height of summer here in Chicago. There’s a diner near our house that my wife and I like to visit at least once or twice per month. It’s called Les Brothers and there’s nothing fancy about it. There are probably diners just like it in practically every town and state. Going vegetarian and vegan has presented challenges when it comes to breakfast. The service is often bad. That food it generally pretty good. And the ambience is relaxed, friendly and inviting. We like it because we feel comfortable there. Whenever we go to Les Brothers, I always order the same thing. I’ve been having the corned beef hash and eggs over easy with Greek toast every visit for about the past 10 years and each time it’s exactly the same: Superbly delicious. I especially love the fact that they give you four eggs with it! So when Sandi and I decided that we weren’t going to eat meat anymore, the first thing that occurred to me was that I wouldn’t be able to enjoy my Les Brothers breakfast. In fact, to be totally honest, the thought of giving up my favorite breakfast at my favorite greasy spoon diner probably delayed our eventual conversion to vegetarianism for several months. Finally, however, we cut the cord. So long, corned beef hash, my old friend. I will miss you dearly. 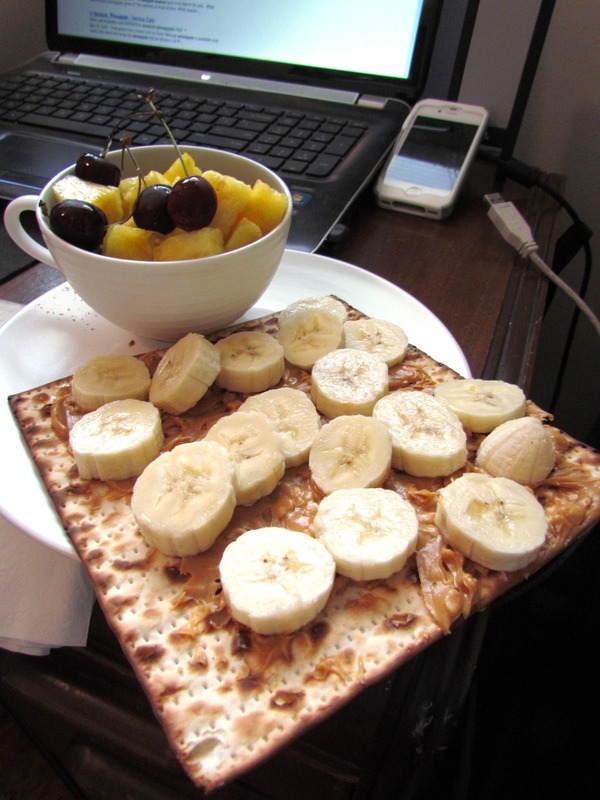 For me, breakfast poses probably the biggest challenge to eating vegetarian, and especially eating vegan. For as long as I can remember, the first meal of the day has been associated with eggs, bacon, sausage, ham, cheese, corned beef hash or some other now-forbidden ingredient. So I’ve been a little more permissive with myself when it comes to breakfast. While meat has been taken off the table — both figuratively and literally — I am slowly weaning myself away from eggs and cheese. For example, whole eggs have been replaced exclusively with egg whites. And instead of gobs of unhealthy shredded cheese — or worse yet, processed cheese food — I’ve been allowing myself to enjoy queso fresco, a light and tasty Mexican cheese (translated as “fresh cheese” in Spanish) made from either raw cow milk or a mixture of cow and goat milk. 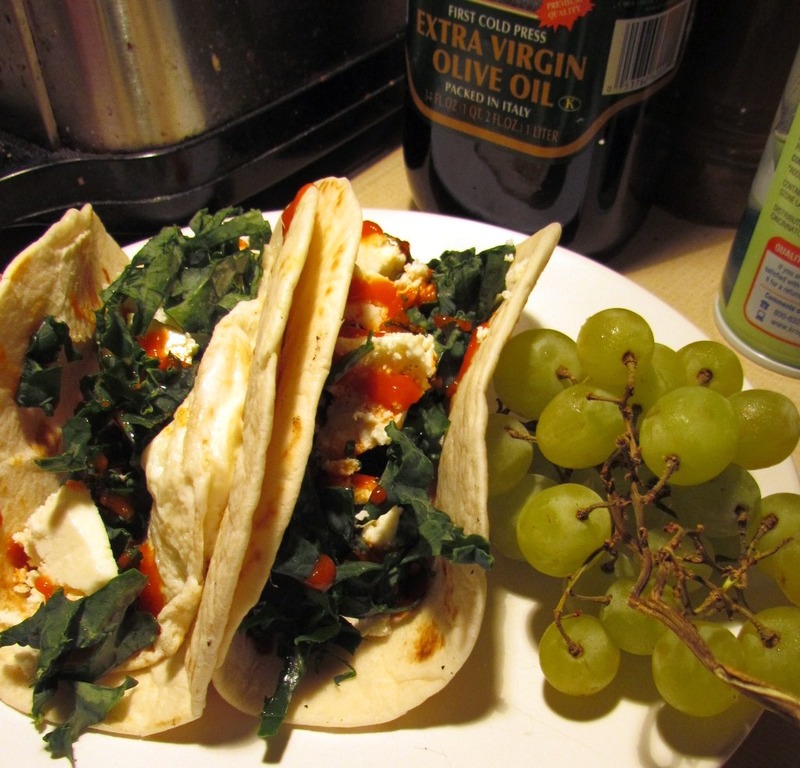 Mild-flavored and crumbly like feta, but without as much saltiness, queso fresco is the perfect accompaniment to these breakfast tacos made with egg whites, fresh chopped kale and a little Sriracha sauce. Now that summer’s here, fresh fruit at the height of its ripeness is at its most affordable at the produce markets. Lately, we’ve been enjoying an abundance of fresh Michigan cherries and whole pineapples for as little as $1.50 apiece. So while it has been difficult to say goodbye to my traditional, if unhealthy, favorite breakfast, it’s been a joy to discover new and delicious breakfast options that are both healthier and more flavorful. It’s about time we started creating some new traditions anyway. The 'Ali Way' to a Chic Life.